Every explosion is predictable in the post-WWII Danish drama Land of Mine. 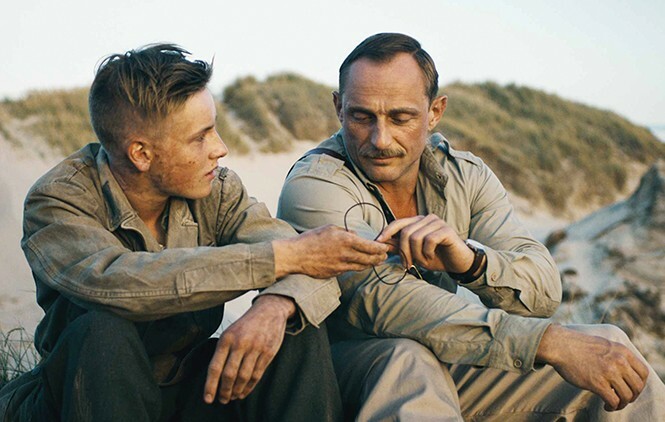 It came as something of a shock to discover that the original Danish title of Land of Mine—a Best Foreign Language Film nominee at this year's Academy Awards—was in fact Under Sandet, which translates as "Under the Sand." The surprise isn't that the title was changed—perhaps to avoid confusion with the 2000 French film Under the Sand—but that there was ever anything about the movie that wasn't ham-fisted and obvious. The nudging play-on-words of the title Land of Mine? That feels like it should have been the perfect choice all along. Because Land of Mine is both about somebody feeling possessive about his land and—get this—about land mines. And if you expect writer/director Martin Zandvliet is going to get any subtler than that, you're in for a looooong 100 minutes. It begins with Carl Rasmussen (Roland Møller), a captain in the Danish army, seething as occupying German troops march out of the country in May 1945. He spies one of the soldiers carrying a Danish flag, and begins beating the man senseless for daring to lay his hands on the object. "This isn't your flag!" Rasmussen screams. Perhaps quite understandably, where Germans in his country are concerned, he has some issues. So it's not an easy marriage when Rasmussen is placed in command of a group of young German soldiers, who are tasked with finding and defusing the German land mines buried around the Danish coastline to defend against Allied attack—some 45,000 on the one beach to which Rasmussen's crew is assigned. They are de facto prisoners of war, and Rasmussen isn't about to feel sympathetic that they're not getting any of the precious available food as they go about their dangerous work. Or will he, eventually, come to see his charges as people, deserving of being treated as human beings? I'll wait here while you think about it. It would be irritating enough if that narrative arc were the only by-the-numbers thing going on here, the ebbs and flows of which can be timed precisely based on the moment when another Danish officer asks Rasmussen, "You're not beginning to like them, are you?" or the inevitable backslide after Rasmussen and his men share a happy game of soccer. It's a movie that's built around the tension of men engaged in a task where death might come at any moment, except that it's excruciatingly clear exactly when somebody is going to get blown up. It will happen immediately after a long, drawn-out scene in which a nervous German seems to be the likely first victim, and then isn't. It will happen when someone is yelling across the beach about a dangerous situation, but not loudly enough to be heard. It will happen when you have just heard someone talk about what they're going to do when this damned mess is all over and they can just go home—because a century of war movies hasn't set viewers up for how to identify Private About-To-Go-Home-In-A-Body-Bag. Land of Mine is a tension vacuum. You couldn't wring less anxiety out of this premise if you tried. It might have been easier to take if Zandvliet had at least devoted more time to character study. The Germans are mostly interchangeable, with the exception of an intelligent soldier named Sebastian (Louis Hofmann), German officer Helmut (Joel Basman) and a pair of twins. Møller gives Rasmussen as much humanity as he can under the circumstances, but there's never an attempt to give his anger any nuance, or a particular history. There's a woman and her young daughter on a nearby farm, but they only exist so that the girl can wander onto the beach and require a life-threatening rescue. Land of Mine might as well be a Medieval morality play, for as much as these people exist for any reason other than imparting lessons in forgiveness and tolerance and whatnot. I haven't even mentioned the dog. I probably shouldn't mention the dog. The dog has his own preordained function as well, and it's even more cringe-inducing than anything involving the humans. The people in the Motion Picture Academy who decided this was one of the five best non-English language films of 2016 have a lot to answer for.